This entry was posted on May 1, 2012 by Robyn Lee. It was filed under Spring 2012 and was tagged with bald eagle, challenge, control, gunshot, injury, Lao Tzu, nature, NY, power, refuge, sanctuary, self-empowerment, Taoism, wildlife. Lao Tzu – one of my long time favorites… well drawn perspective.. Thank you kindly Dean. Yes – classic teachings here. Reminders are good!! and you remind us, Robyn.. This is simply hair rising striking. His gaze, wow. I love this quote, the pictures great too, I’m loving the eyes. Thanks for sharing Robyn. Ahhh..a friend of Hooter’s….I like the way he’s framed within the bars…still proud but a bit sad…. I love that quote and the picture is great to go along with it. 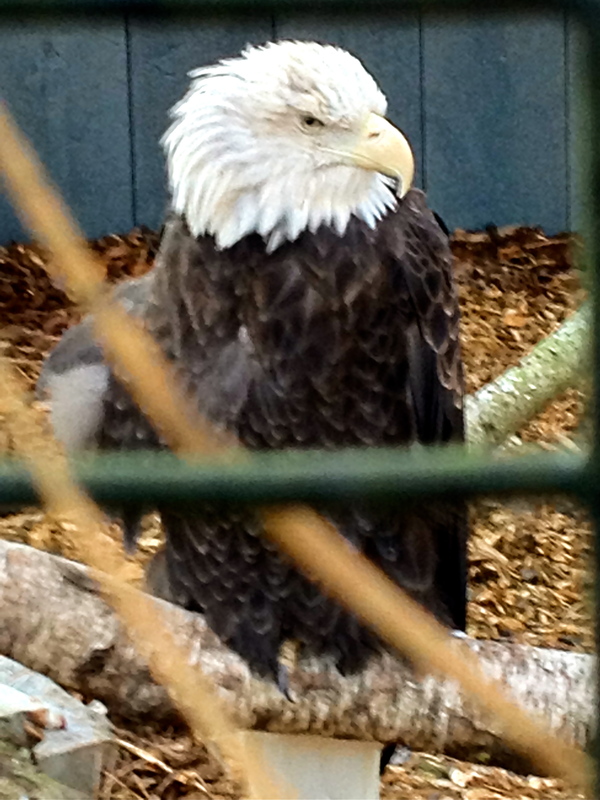 This eagle was unlucky to get shot, but very lucky to be rescued so he could live a nice life.